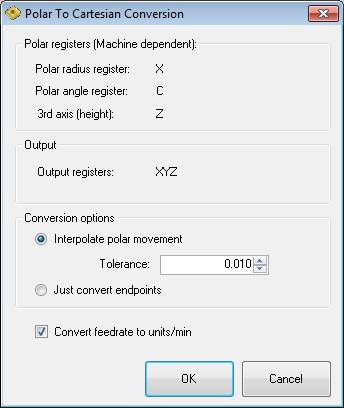 Use this option to convert polar toolpath to Cartesian (XYZ code). Polar register is dependent of machine rotational axis settings. For output CNC code you can define if it will be interpolated with a given tolerance or just block endpoint will be calculated in Cartesian coordinates. If you check option "Convert feedrate to units/min", feedrate values in selected CNC code will be recalculated from deg/min to units/min for each movement.